I decided I wanted to become an optician when I was 18 years old. A friend of mine was interested in the industry, and once we got talking, I realised it appealed to me too. Many moons later, I now co-own my very own practice. We run things a little differently to other practices however, and our opticians personally look after every patient they see from the moment they enter our practice until the moment they leave. That gives us 100% responsibility for our patients, and allows us to build great relationships with each and every one of them – something I particularly enjoy. When I was 15 my younger brother was diagnosed with a rare eye condition. At the time, I was doing my GCSE’s and considering which career path I wanted to take. I was fascinated by the investigations and treatment he was given by Bristol Eye Hospital and as a consequence decided to go and study Optometry in Cardiff. I am now a partner within the business and very much enjoy the clinical side of Optometry having attained my ‘EHEW’ and Low Vision accreditation as well as a professional certificate in Medical Retina. Lewis graduated from Cardiff University. He joined Evans & Hughes in 2009 and became a director in 2017. He mainly works in the Ammanford and Llandeilo practices. He has undertaken further qualifications in Glaucoma and Independent prescribing. He also does sessional work at Glangwilli hospital for the local eye department. In his spare time he enjoys travelling, football, cycling, skiing and playing guitar. I started working for Evans &amp; Hughes in 2010 as a pre-registration student and have been fortunate to have stayed part of the team ever since. Within the past years, I gained my ‘EHEW’ accreditation, Low Vision and Medical Retina qualifications. Following a work experience placement at Evans & Hughes whilst still at school, I decided that Optometry was the career for me. After studying Optometry at Manchester University, I was given the opportunity to return to Evans & Hughes as a full time Optometrist, and am still here 15 years later. I currently work part time whilst also raising a young family. I’m a first language welsh speaker and am happy to communicate in either language. My interest in the industry developed when my aunt was diagnosed with cataracts and glaucoma. Considering that she had been significantly short-sighted since the age of 14, I was fascinated when cataract surgery converted her short-sightedness to long-sightedness, and enhanced her clarity of vision. Suddenly, she no longer relied on long-distance spectacles and required only spectacles for reading small print! Coupled with the fact that I enjoy science, maths &amp; developing relationships with the general public, this was an ideal career path for me. I enjoy working with Evans &amp; Hughes as it provides the opportunity to accommodate patients with a range of ocular demands from the moment they step through the door to the moment they leave. 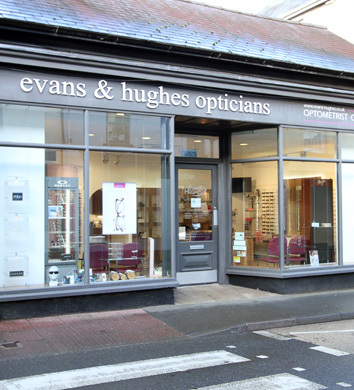 We have opticians who are fluent in both English and Welsh at Evans & Hughes, so you can look forward to a friendly face and a language you prefer. Click here to learn more about our sight tests.